A two-day symposium celebrating Black History Month will be held at York University on Feb. 8 and 9. “Black Leadership, Partisan Politics and Social Activism” will bring together community leaders, activists, academics and students to discuss the limitations and possibilities of political representation and social activism for advancing Black communities. The symposium will open with a reception and a conversation with David Austin and Amoaba Gooden on the evening of Feb. 8. The conversation will be facilitated by Professor Tamari Kitossa. The reception takes place from 5:30 to 7:30 p.m. in the Martin Family Lounge, Accolade East Building. Two panels will take place on Feb. 9 beginning at 10 a.m., featuring invited community activists and organizers. 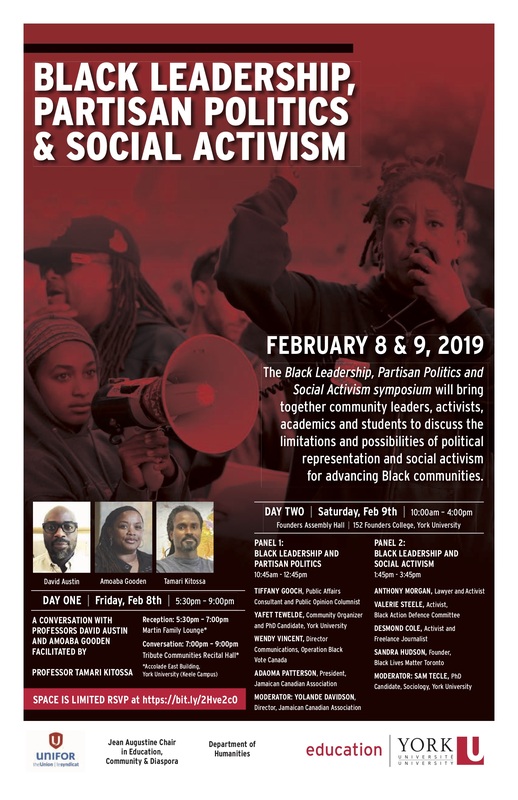 Panel 1, on “Black Leadership and Partisan Politics,” runs from 10:45 a.m. to 12:45 p.m.; Panel 2, on “Black Leadership and Social Activism,” runs from 1:45 to 3:45 p.m. Both events take place in Founders Assembly Hall. The event is presented by the Jean Augustine Chair in Education, Community & Diaspora, a University Chair in York’s Faculty of Education that aims to advance access, equity and inclusivity to education through community engagement and collaborative action. Carl E. James currently holds the Jean Augustine Chair in Education, Community & Diaspora. He is a professor in the Faculty of Education and holds cross-appointments in the graduate programs in Sociology, Social Work, and Social & Political Thought. Space is limited. To RSVP, visit this link.